Orange Mittai has its sweet and sour moments, with just the right balance of humour and emotions, says S Saraswathi. Actor Vijay Sethupathi has never been afraid to experiment with unconventional roles and offbeat films. He was widely appreciated for his role as a hangman in his previous film, Purampokku Engira Podhuvudamai. 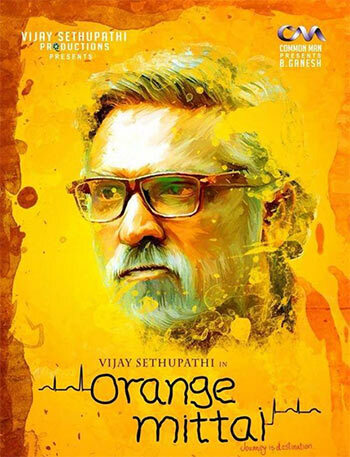 He returns with yet another distinctive character in his latest venture, Orange Mittai. Vijay plays Kailasam, an arrogant, short-tempered 55-year-old, whose only source of entertainment in his boring life is his frequent trips to the hospital. Orange Mittai is directed by acclaimed director Biju Viswanath, whose works include award-winning films like Déjàvu and Marathon. The film also marks Vijay's debut as a producer and dialogue writer. The film has music by Justin Prabhakaran. Satya (Ramesh Thilak) is a young paramedic, who administers first-aid to patients in an ambulance. He is a sincere worker, who takes great pride in his job. His friend Arumugam (Arumugam Bala), the driver of the ambulance, however is a loud-mouthed funny guy, who robs patients when they are unconscious. Satya is going through a difficult time in his personal life. His misses his father, who died a year ago. He was not in good terms with him, and now has regrets. His girlfriend's father wants him to leave his low-paying job and assist him at their family-run store as a condition to marry his daughter. Satya is in a dilemma and it is at this time that he is called to pick up Kailasam, who is suffering from a heart condition. The two meet as strangers, and form a bond. Biju Viswanath, who is also the cinematographer and editor of the film, has cleverly shot most of the scenes with the lead actors, travelling. The ambience is such that film appears more like a real-life incident. The editing is spot on. At just one hour and 41 minutes, the film seems to end too soon, despite the slow and unhurried pace. Ramesh Thilak gives an excellent performance and though slightly over-the-top, Arumugam Bala too does a good job. But it is the powerful presence of Vijay Sethupathi that has you completely hooked. He has got every expression, every movement right, even the silly grin and the frequent coughing fits. The well-oiled, neatly parted hair, discoloured teeth with a distinct paunch and thick glasses complete the look with scarcely a reminder of the young actor. Definitely a role of a lifetime for this versatile actor. Like the candy it is named after, Orange Mittai with its sweet and sour moments, is a beautifully narrated film with just the right balance of humour and emotions.